There are several ways to work your way around a page and throughout the site. I discovered one or two while I was making the image, so I don't claim this is a comprehensive tutorial, but I'm sure it will help you learn to zip through the site to get where you want to go. 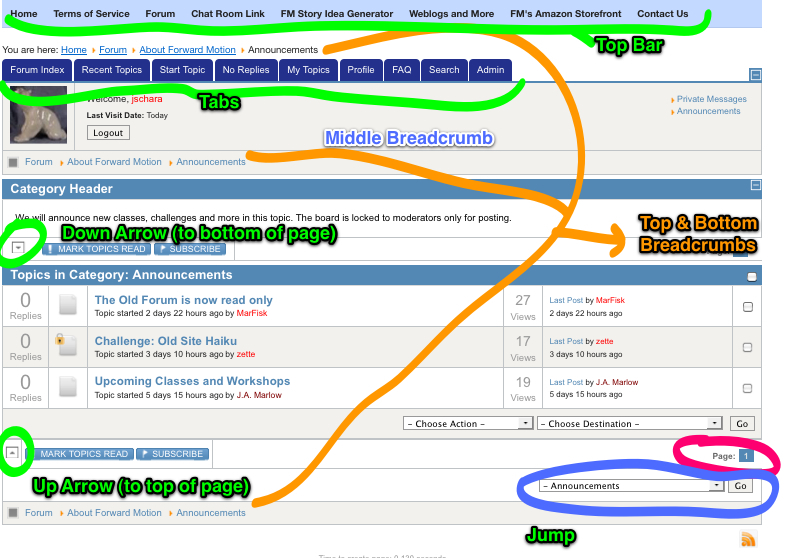 First, there's the Top Bar (noted at the top of the image in green) That is macro site navigation. Home will take you to the entry page to the site. Terms of Service are always available for your review. The Forum is where we are now. Then there's chat, the story idea generator, weblogs and more (Vision and Flash Friday), FM's Amazon Storefront (if you haven't been there, yet, please check it out), and the Contact link. Also in green, are the tabs you'll see at the top of the page. I've covered their purpose in another FAQ. In orange, you'll see where I've pointed out the top bottom and middle breadcrumbs. You can step yourself back to any point along your path. The next two items I'm going to discuss, you probably haven't noticed (I hadn't either -- another member pointed them out--thanks, albatross!) Those are the down arrow (which will whisk you to the bottom of the page -- and the last entry on that page) and the up arrow (which will whisk you to the top of the page). This really reduces the amount of scrolling. At the bottom of the image, circled in pink, are the page indicators. The Announcements section used in this image only has one page, but when more than page exists, you can click the page to move around. Finally, circled in blue, in the Jump window. If you know where you want to jump to, click the down arrow in the jump window for a selection of categories, select the one you want, and click Go. Becoming familiar with these tools conveniently located on your site page can help your site navigation efforts and help you get where you want to go faster. Last Edit: 6 years 6 months ago by jschara.